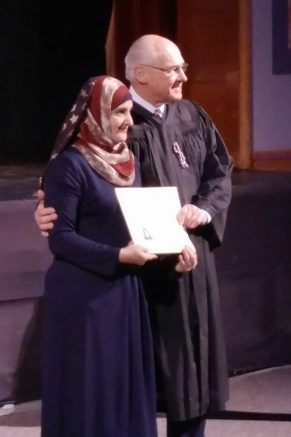 The morning of Thursday, March 29 offered a unique learning opportunity to seniors at West Seneca West Senior High School as they witnessed 53 people representing 25 countries take an Oath of Allegiance to become United States citizens during a Naturalization Ceremony in the school’s auditorium. After enjoying refreshments in the cafeteria and music by the school’s string nonet, the Honorable Leslie G. Foschio began the event with opening remarks to all in attendance, including Superintendent Matthew Bystrak, Principal Jay Brinker and retired Superintendent Dr. Mark J. Crawford. Laura Low was next to approach the mic. Aside from teaching Spanish, Low advises 40 dedicated students in the high school’s International Relations Club (IRC). This is the club’s second year hosting the ceremony on campus, in collaboration with United States Citizenship and Immigration Services (USCIS). Leading up to the event, USCIS Community Outreach representatives visited participation in government and economics classes to educate students about the process of becoming a naturalized citizen. For several years, IRC has collaborated with Journey’s End Refugee Services to fully furnish apartments for incoming refugee families. Through Journey’s End, Low had the opportunity to meet and get to know Bishnu Adhikari, an employment specialist with the organization. Touched by his story, Adhikari was asked to speak at the Naturalization Ceremony. The candidates were then asked to stand and recite an Oath of Allegiance, led by Courtroom Deputy Giuseppe Ippolito, followed by The Pledge of Allegiance and music by West Senior’s Vocal Jazz Ensemble. They were then introduced one at a time to receive their certificate and an American flag and meet members of local civic groups. Be the first to comment on "West Seneca West Senior High School welcomes new U.S. citizens at Naturalization Ceremony"